Sometimes setbacks happen. I had been planning an article on top to bottom graphics hardware performance in Far Cry 2 for this week. This was already pushing it with a platform change, and it just got to be too much to get it all finished in time. In time for what? Well, in this case it was the fact that AMD just released a new hotfix driver for Far Cry 2 that fixes a couple rendering issues the original hotfix had. It wouldn't do to publish an article with numbers from an old driver, so here we are retesting things. But that's no reason to disappoint our readers. Far Cry 2 is a decent looking game that many have been interested in for a while. I haven't really played the game much (just doing testing) so I can't comment on the goodness of the game. But I can comment on the complete awesomeness of the benchmark tool it comes with. The Far Cry 2 benchmark tool owns all other built in benchmark tools around. So far there are only two issues we have with it. We want it to be able to take screenshots at a specific frame or at specific intervals, and we want it to be just a little more stable. The former issue is of less importance than the latter, as there are other ways to take screenshots. But stability is the only thing that really stands in the way of some incredible analysis. If running more than 5 to 10 different test cases, we've found the tool to be likely not to complete. If individual runs fail, we'd still like to see the benchmark continue, but unfortunately it just stops. Comparing this to the DX9 and to the Radeon HD 4870 in both DX9 and DX10 will be quite informative. As we can see, even at the maximum possible settings, we still get playable framerates. This is really a testament to the engine, as Ubisoft were able to do some great things with the visuals while still providing excellent playability across the board. Under DX10, High and Very High quality settings don't differ in performance nearly as much as Ultra. In fact, you can get Very High quality with 4xAA for about the price of Ultra quality in most cases with this test under the GTX 280. Performance with 4xAA tends to drop off faster as resolution increases than without regardless of quality mode. This makes sense because as resolution increases the added memory needs for 4xAA increase as well. I'll get in to more analysis of the data when we get the numbers for the article done. The benchmark tool offers lots of other cool features beyond just running billions of tests in an automated way. For instance, we can run fixed time length demos in which the camera travels a path and frames are rendered as fast as possible -- like the game is played. These are similar to FRAPS tests, but the data that's collected is much more repeatable because the camera path is fixed. We can also run a fixed number of frames timedemo. A timedemo is useful because it renders the exact same set of frames each time as fast as possible. This way, we have a more consistent work load and know what's going on better. Of course, this stresses different things. Each type of test has it's use, and buidling in this kind of flexibility is incredible. We commend Ubisoft for creating such an AMAZING benchmarking tool. I hate SecureROM because dealing with activations is tough when we build and/or reinstall new systems all the time and our hardware is always changing. But the benchmark tool almost makes up for it. Almost. Every other game developer needs to copy this tool immediately and put it in every game. A couple of very old 8800GTX's Q6600 @ 3.2Ghz are faster than a single 280GTX on this engine. It is a well optimized graphics engine. I did the last run at 1280 x 1024 for apples to apples since my native resolution is 1920x1080 as opposed to the comparison resolution of 1920x1200. I cannot get DX10 and AA to work with this game at all! I've tried 178.24, 180.42 and 180.43, NONE of those drivers will give me DX10 and AA at 2560x1600! 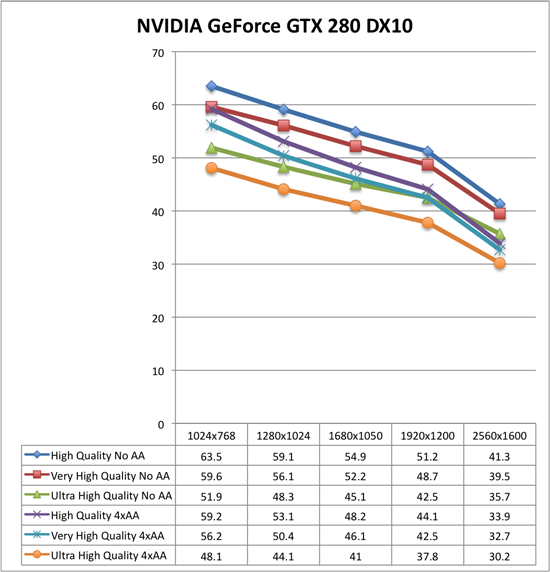 Do you plan to investigate the new Stalker game AMD DX10.1 vs nVidia DX10 quality performance situation as well? Please note (also in the article) that the GeForce DX10 and Radeon DX10.1 card are not doing the same amount and type of calculation with AA enabled! So might worth noting that one-to-one compare is not possible or "fair", both on performance and quality. I been looking at getting a new PC for the last 6months at least but just aren't happy with whats out there. The main idea behind the new PC is to play games. I been waiting for the new Nehalem CPU but I have been thinking I am probably better off making sure I get the latest GPU compared to the new Nehalem. Would be good to get a comparison of whats more worth while throwing money at. I think a lot of people suffer from this problem.